Wear your seat belt and make sure it is fastened securely. Locate the exit closest to you. Remove sharp objects such as pens and pencils from your pockets. If a crash is imminent, cover your head with a pillow, cross your arms over your calves, and grab your ankles. If you are lucky enough to survive an airplane accident, extricate yourself from the crash scene as quickly as possible and seek immediate medical attention. Do not push other passengers, scream, or shout – chaos can hamper rescue efforts and cause more injuries. Air travel is one of the safest methods of transportation, yet faulty equipment, pilot error, and improper maintenance can cause plane crashes. The majority of aviation accidents involve privately owned and operated aircraft, not commercial airplanes. 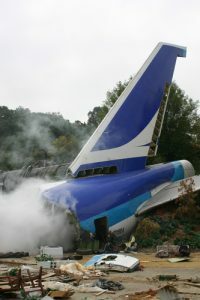 When a commercial aircraft does crash, there are usually few (if any) survivors. To receive compensation for an injury suffered in an airplane crash, you must take specific steps required by aviation law. This is why it is important to contact a legal firm that has expertise in dealing with the regulations set forth by the FAA (Federal Aviation Administration) and the NTSB (National Transportation Safety Board). You will find that expertise right here in Michigan at Thurswell Law. An airplane crash can be one of the most traumatic experiences a family can face. Whether you are injured or have suffered the loss of a family member in a catastrophic airplane accident, you are entitled to fair monetary compensation. As a victim, you are entitled to be reimbursed for medical expenses, loss of wages, loss of future earning capacity, and loss of enjoyment of life, among other losses. Surviving family members may get compensation for funeral expenses, loss of income (present and future), and medical bills. Call our knowledgeable team of legal experts at Thurswell Law. There is no fee unless you collect. Call for your free consultation at 248-354-2222.